Does anyone know the specs for the pre-charge resistor in the imiev battery pack? In the process of diagnosing a failure to start (go into "ready") of our imiev, we believe we have isolated the issue to the pre-charge contactor and resistor. We are able to trigger the negative, main positive and pre-charge (positive) contactors from the connector on the side of the pack (C-22). We can hear the contactors, and we get a half-pack voltage reading from the main positive and main negative (from inverter main cable to the main fuse under the car), but no voltage reading from pre charge contactor. I suspect the pre-charge resistor has burnt out. Unfortunately there doesn't appear to be any way to access this aside from getting the battery out of the car. I'm hoping to borrow time on a hoist and drop the pack out to confirm and change over the resistor. However in order to not to tie up the hoist longer than necessary I'd like to have the part on hand, but I don't know the specs. 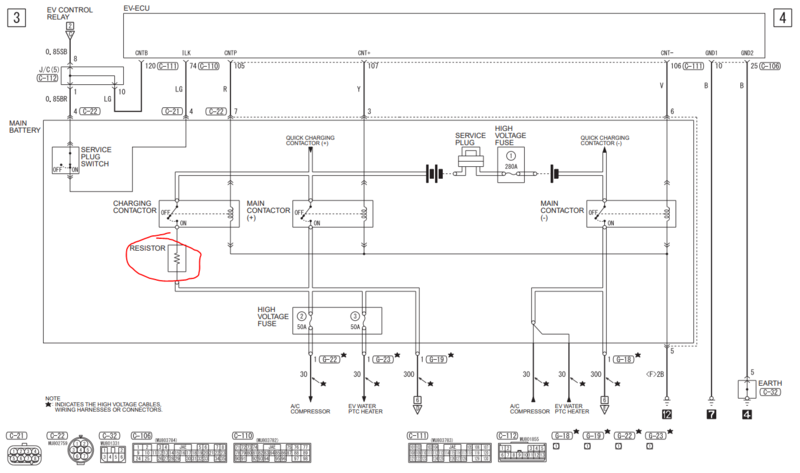 The part is labeled in the service manual circuit diagrams as "resistor", but without specs. There was a forum user "Dani" that dismantled a wreck to add a second pack to his car. He had it open with photos of the contactors and resistor, but i couldn't read the value. i had sent him a PM to request the value, but never heard back from him. JRM = Japan Resistor Mfg. Co.
has a short-time overload rating of 1000% rated power (10x O/L factor) for 5 seconds, so should work here. Last edited by kiev on Mon Dec 03, 2018 2:20 am, edited 1 time in total. 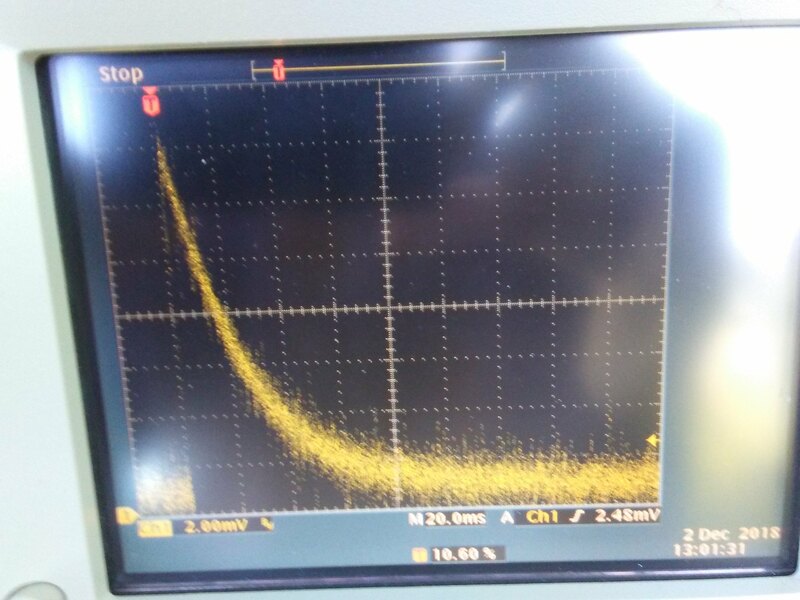 Here are some scope overlays and trace using a 1mV/amp clamp-on current probe at the MCU with different time base and scaling options to capture the inrush current when starting to READY. 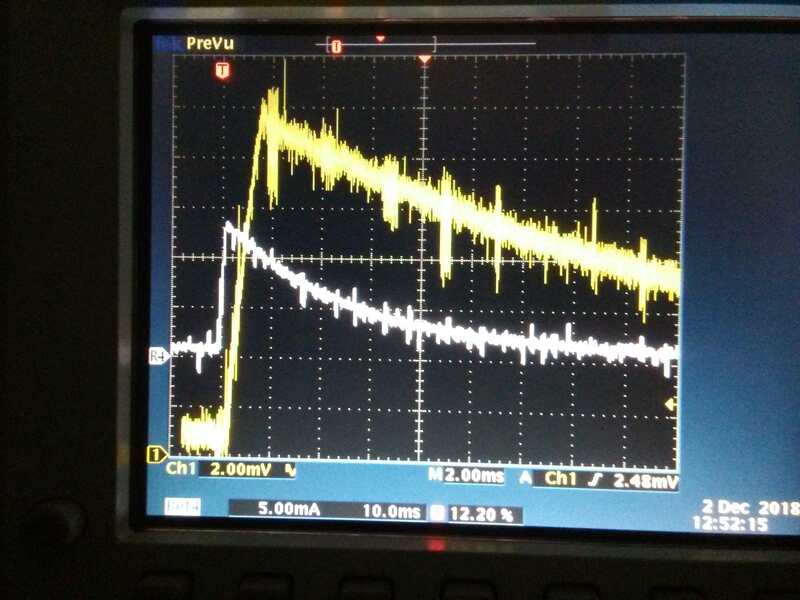 It looks like the initial current kick is about 14 Amps in ~2 msec, then current tapers back down to zero as the 220 and 800uF caps fill in about 120 msec. The resistor has to dissipate the energy stored in the capacitors over the precharge timeframe, which occurs in about 5 time constants, where one time constant is R*C = 24R * 1020uF =~24msec, so Tpc = 5 time constants is 0.122 sec. This can be seen in the scope trace where the current drops back down to zero. The energy stored in the cap charging up to 360 Volts is E = 0.5 *C * V^2 =~66 joules. So the resistor power during precharge is E/Tpc = 66j/0.122s = 540 Watts , which is a short-time overload factor of about 13x for 1/8 of a second. The JRM datasheets indicate they are designed to handle 10x overload for 5 seconds. These are some very rugged high power resistors that are able to handle the massive power overload. Last edited by kiev on Tue Dec 04, 2018 8:24 am, edited 3 times in total. Don wrote: Ohmite makes a 25 ohm, 40 watt, 5% wire wound resistor. Yes, but can it handle the spectacular peak power? It doesn't seem physically large enough. It will be tough to "fill those shoes". Yes; this is straight Ohm's law, with the capacitors initially a short circuit. 340 V / 24 Ω = 14 A.
then current tapers back down to zero as the 800uF cap fills in about 120 msec, which is 6*RC time constants with R = 24 Ohms. Everybody seems to be ignoring the extra 220 μF in the back end of the charger, making the total capacitance 1020 μF. So RC = 1.02×10⁻³ x 24 = just under 25 ms. After 5 time constants (τ=RC), the current is less than 1%. It's less than 5% after 3 τ. Using 5 τ and 1020 µF, we get 122 ms, as observed. The resistor has to dissipate the energy stored in the capacitor over the precharge timeframe, which is considered to be 6 time constants, where one time constant is R*C = 24R*800uF =~20msec, so Tpc = 6 time constants is 0.120 sec. This can be seen in the scope trace where the current drops back down to nearly zero. That's all more or less true. The energy stored in the cap charging up to 360 Volts is E = 0.5 *C * V^2 =~52 joules. For 360 V and 1020 μF, it comes to 66 J. So the resistor power during precharge is E/Tpc = 52j/0.12s = 435 Watts , which is a short-time overload factor of about 11x for only 0.120 seconds. That's the average over the pre-charge time, with the majority of it nearly zero. But the instantaneous peak really is 5400 W. Using my figures, I get 541 W average. This is 13.5 × nominal. And the initial peak power, which is only for milliseconds, is 5400 W or 135 × nominal. It has to suffer that eye-watering overload for non-zero time. It's not obvious to me that any random resistor not designed for pre-charging or at least for high peak loads will stand up to this treatment. The JRM datasheets indicate they are designed to handle 10x overload for 5 seconds, so that's why Mits is using it. It's presumably up to the job. The Tyco HSC series I've used before are rated for only 5× overload for 5 seconds, and 25× for 1 second. It's a pity the graph only starts at 1 second. As for wanting a gentler pre-charge, 14 or 15 A is a doddle for these capacitors. Also, a higher value pre-charge resistor will have lower peak power, but for a longer time, and it ends up dissipating the same energy (the energy in the capacitors, ½CV²). So it's all about safely handling the initial peak power. Here's an example of an ARCOL resistor made in the UK with similar specs as the JRM, just need to find it in 24R. 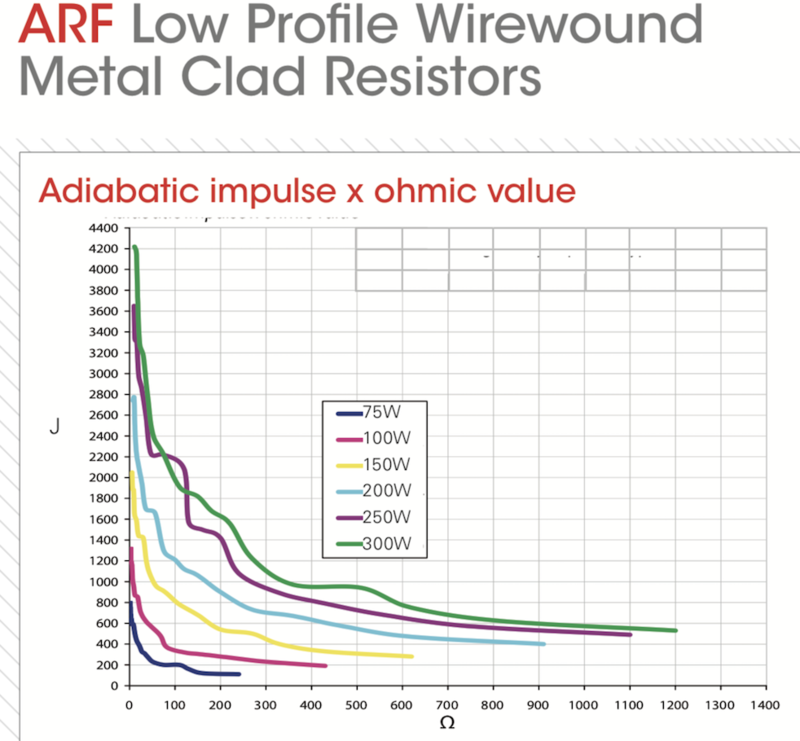 They also show an interesting adiabatic impulse curve in the datasheet. This is a situation in which the rapid inrush occurs so fast that the materials are assumed to not have time to change temperature. The initial spike is on the order of 11 J, and the entire precharge is the 66 J. Their lowest rating is 75W, but it looks like there is plenty of room under the curve to do the job. kiev wrote: Here's an example of an ARCOL resistor made in the UK with similar specs as the JRM, just need to find it in 24R. Looks good. Except that the only "standard" value for the 75/150 W model seems to be 3 Ω. So that's the only value that Mouser and Digi-key stock. It looks like they'll make a custom value for you, up to 220 Ω, but I'm sure the minimum order quantity would be prohibitive.